On Monday, we left our adorable apartment in Prague and headed by train to Berlin, Germany. We opted for first class for this trip (which always excites Artie). The four and a half hour journey was one of the smoothest train rides that I have ever taken. Marcus and Morgan enjoyed getting some reading and work done on the train, but Artie was less than impressed with the experience. There were comfortable seats, but no white table linens with this first class trip. Berlin (like most major European cities) is packed full of culture and history. I think you could spend a lifetime there and still not see everything that there is to see. 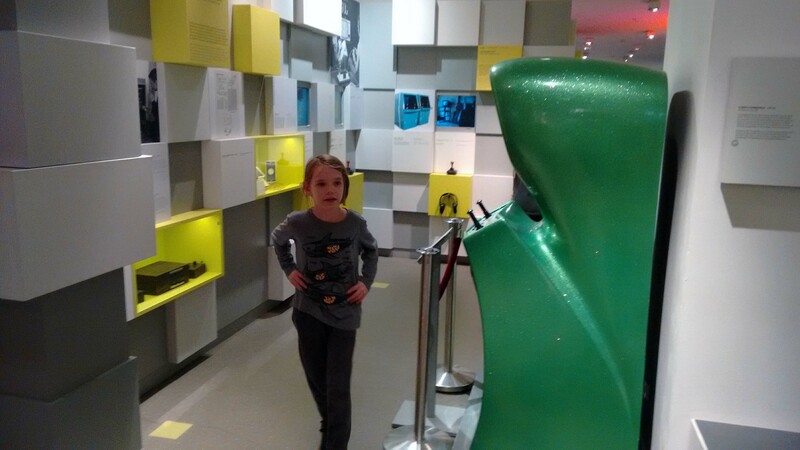 We toured the city using a combination of walking, public transit and Hop On Hop Off tours. The public transit here took a bit for us to figure out and it uses a combination of buses, trams, subways, and trains to move people throughout the city. 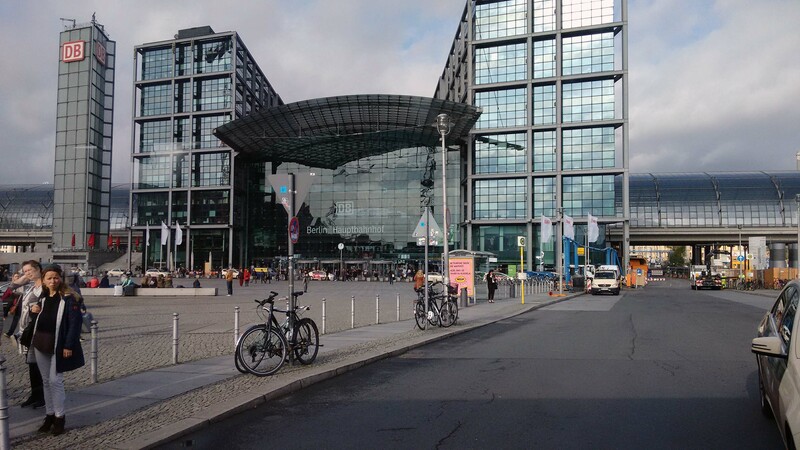 This is the Berlin Central Station which is part transit center, part mall. 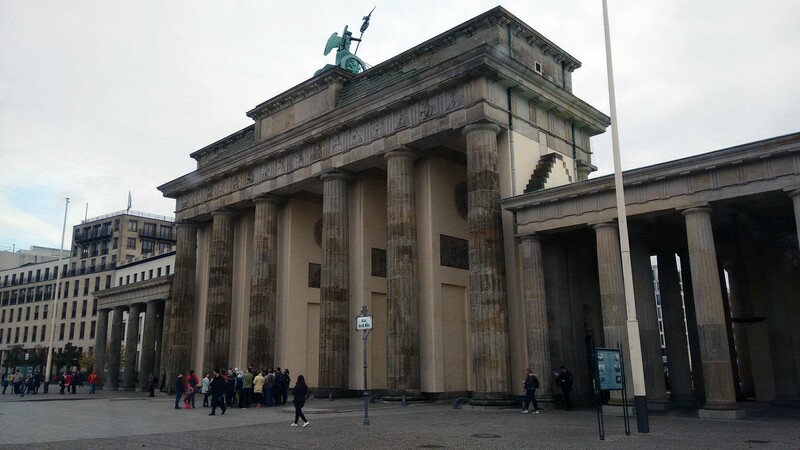 One of the places that was a 10 minute walk from us was the Brandenburg Gate. During the time of the cold war, this gate was a part of the Berlin wall separating the eastern and western parts of the city. The Holocaust Memorial is very close to the gate as well. As we did our bus tours around the city, one theme that seemed to be recurring was relocation. At different points in history, different buildings and moments were relocated (and yes, a significant number of relocation happened during and immediately after the Second World War). One of the monuments that was relocated was the Berlin Victory Tower. I’m not sure that any picture could do justice to how magnificent this monument is, in particular the gold cannons and wreaths that surround the rings of the structure. I had unfulfilled expectations in a couple of places in this city. The Lustgarten (or “Pleasure Gardens”) was one of those places. As you can see below, there is a fountain and a lot of lawn. Lawn does not bring me any pleasure. 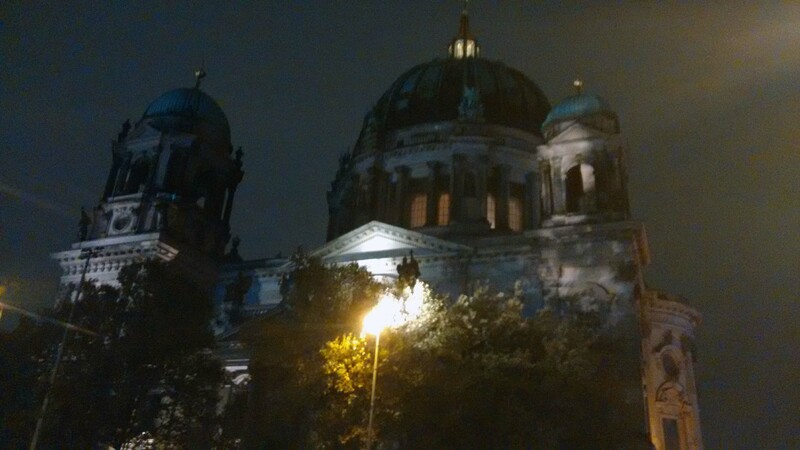 Just a little further up the same street from the Lustgarten, is the Berlin Cathedral (which is technically not a Cathedral). We toured this area both during the day and at night. The photo below was taken when we were on our way to dinner at the oldest restaurant in Berlin, Zur Letzten Instanz (which has lots and lots of gluten free options). After getting a general sense of the city during our first couple of days, we spent our last day in Berlin visiting some places that maybe wouldn’t make it onto everyone’s tour list. But, they were places that made our happy family. 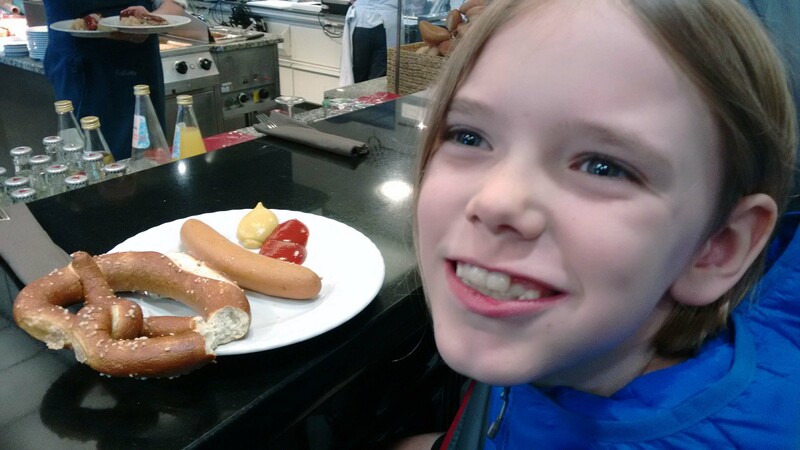 We headed up to the 6th floor of the KaDeWe department store to have lunch. If you are a foodie, this place is a magical wonderland. We all ate different sausages here, and as you can tell from the look on Artie’s face, it was amazing. After tasting the sauerkraut here, I think that we must do something wrong with what we make in North America. I never knew that sauerkraut could taste so good. 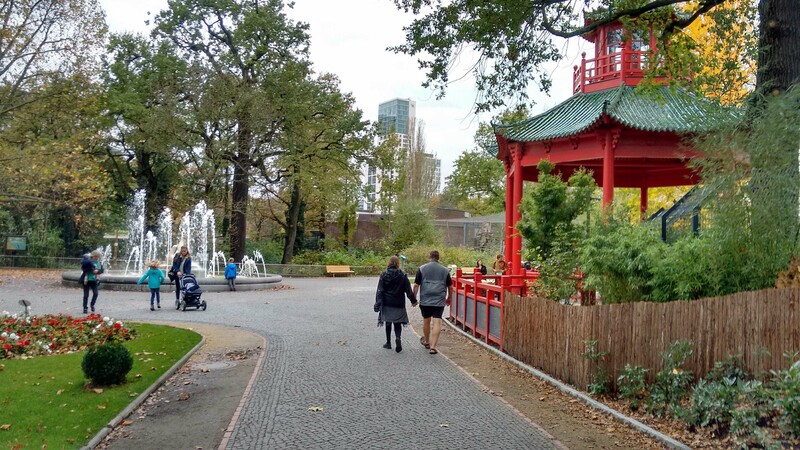 After KaDeWe, we went a few blocks over to the Berlin Zoological Gardens. This is a fairly small zoo size wise, but one of the most diverse species wise. Just a few steps down from the zoo, are the ruins of Kaiser Wilhelm Memorial Church. A new church was built to the right, but these ruins were left as a memorial to WWII. 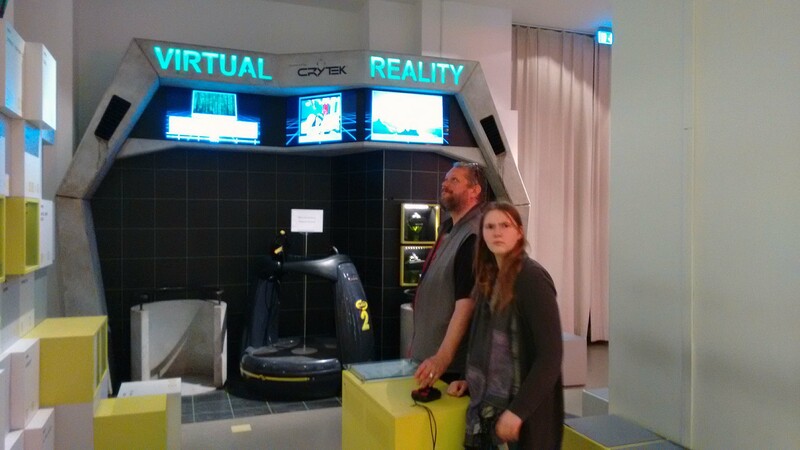 Our final stop was at the Computer Spiel Museum, or the “Museum of the History of Computer Gaming”. When Artie found the flyer for this place, he felt we “HAD TO GO”. So we did. Berlin was amazing (especially the food) and exhausting. And, I know that on our tours we barely scratched the surface of what there is to see and experience there. Another well-summaried and well-photoed tour! Thanks, Kay. Thanks Aunt Lois 🙂 We always appreciate hearing from you. Glad you’re enjoying the seeing along with the history and the current. Thanks, Kay. HI Lois, I am happy you are enjoying Kay’s blog posts. She has done a wonderful job documenting our adventures.